Welcome, and thank you for visiting my new little site. My name is Liz and this corner of the internet is my own pop-up fabric store. True to the description ‘pop-up’, I have started this site just as a temporary home where I can showcase and hopefully rehome some of the fantastic fabric I have amassed over the years. Dressmaking, the love of making things, the love of just having creative fabric dreams is a hobby for me. My fabric shopping has increased dramatically the last few years as I have travelled for work and bought heaps of fabric along the way from some of the great fabric destinations in the world, such as the New York garment district (tons from here), the Italian mills and Montmartre stores like Marché st. Pierre . Well, now I have completely overdone it. I can’t move for all the fabric that I’ve got around me and I need to clear up some space so I thought I might try something different and will now run this online outlet for just a little while. In Australia it can be hard to get top-quality designer fabrics at ‘roll-end’ sort of prices, so I thought I would see how I go offering my fabrics on a dedicated site, here, so fabric lovers have another option for a little while. But, I’m not in a position to run this pop-up store full-time or for a long-time, so this is just a temporary endeavour. I only offer quality fabrics…that’s silks, woollens, linens, cottons and viscose/rayon knits. 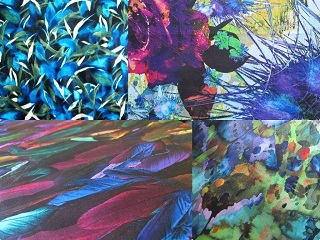 I am sorting out fabrics on a daily basis at the moment and I have hundreds of pieces, at least, to offer up. A lot of the fabrics are designer fabrics, so that’s end rolls from designers such as M@rc J@cobs, Osc@r de la Rent@, Roberto Cav@lli, The0ry, Thak00n, Phill1p L1m, Car0l1na Herrer@, J Cr*w and Miss0ni. Even when I don’t know the name of the designer for a particular fabric, seeing as I am offering up a lot of fabrics from the NYC garment district, often they will originate from one of the workrooms in and around NYC. Fabrics without a known designer ‘provenance’ are still top quality. I am putting up a lot of images of the fabrics so you can get a really good look at each piece. And here and there I’ll post some inspiration shots just because it is fun to think about the different creative options with all these fabrics. In all but a few cases, I have only one piece of the fabric; once it has gone, it’s gone. In the ‘FAQ’ section found at the navigation bar at the top of this page I’ll outline the selling and buying policies for this pop-up. I have sold on Ebay a lot and have nothing but impeccable ratings. I have sold a lot of yarn on Ravelry and have great friends there too, never, ever a problem. But just so you can be doubly sure you can trust me, I will do all transactions using PayPal, who give you a guarantee on your purchase, and will post all goods using only the trackable satchels from Australia Post. Please see FAQ for more info about this. Thanks so much for visiting. Please drop me an email if you have any questions or comments. I’d love to hear from you.